Fun & Funky Furniture to Brighten Your Day! If you’ve been looking for inspiring furniture and found the selection lacking, you’re not alone. But no worries! Here’s a collection of creative, fun, and occasionally quirky seating, tables, and cabinetry to brighten your day. Enjoy! This circular sofa packs a colorful punch and is guaranteed to perk up any public space. 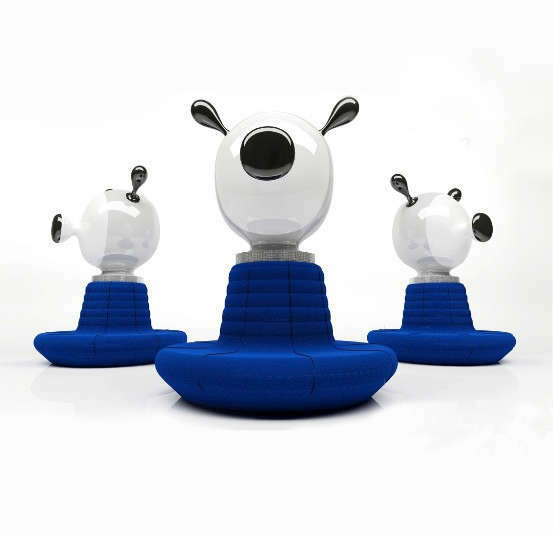 Clown Sofa by Spanish designer Jaime Hayon pushes the boundaries between art and design. Playfully capped by a stylized cartoon head, this striking upholstered piece is also practical: it can accommodate 7 or 8 total strangers at a sitting. 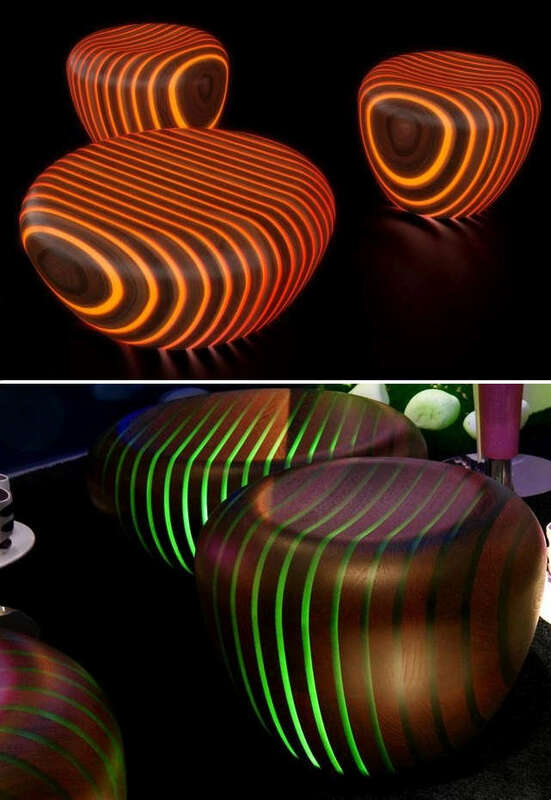 Furniture that comes alive at sunset (or in any low light environment)! Hailing from Luxyde is a series of backlit wood furniture. Bright Woods include a table, chair, coffee table, pouf, floor lamp and table lamp. By using a remote, the light changing LEDs can coordinate colors, patterns, speed and intensity seamlessly across multiple rooms. A multipurpose wall unit that can be installed at any height. Is this a book case or a hideaway desk? The answer depends on your mounting height! 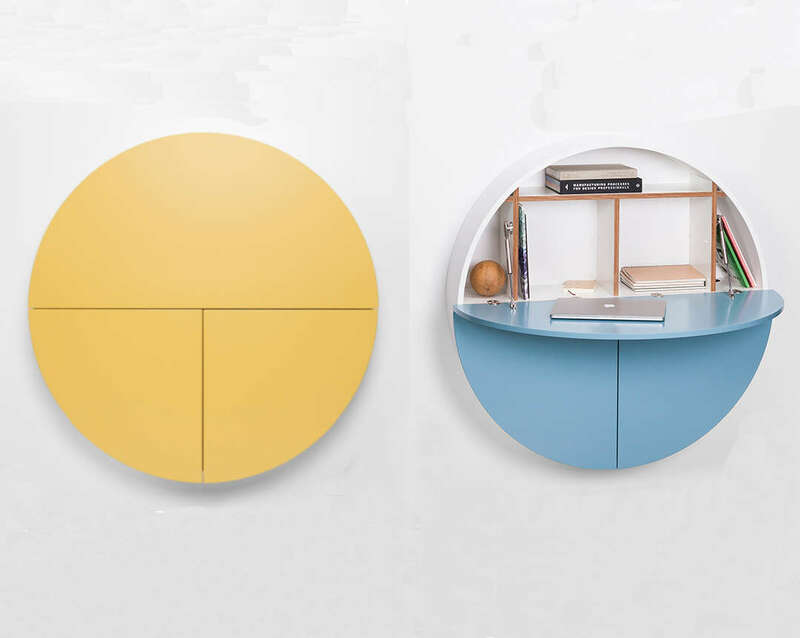 At 43.7″ dia x 12″ d, the Pill with its three compartments of flexible dividers is an antidote to chaotic living. Inspired by Northern Scandinavia, Western Europe, and the Baltic States, this Emko wall unit’s minimalist sensibility is perfectly balanced by soft, cheerful, pastel finish options. This 4-piece wood coffee table with its distinctive whirlpool shaped legs is certainly a design tour de force! 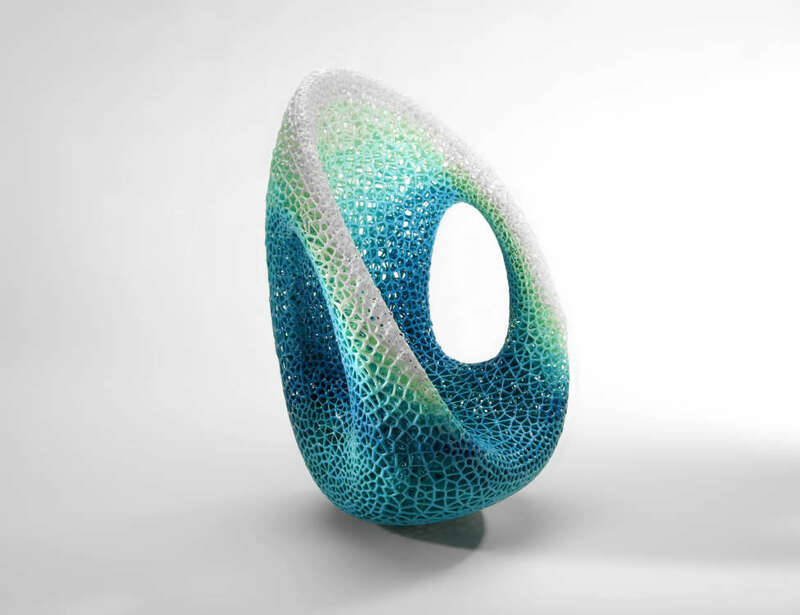 Zaha Hadid’s final project for David Gill Gallery. The creation, crafted from solid walnut, looks light and airy showcasing her trademark curves. 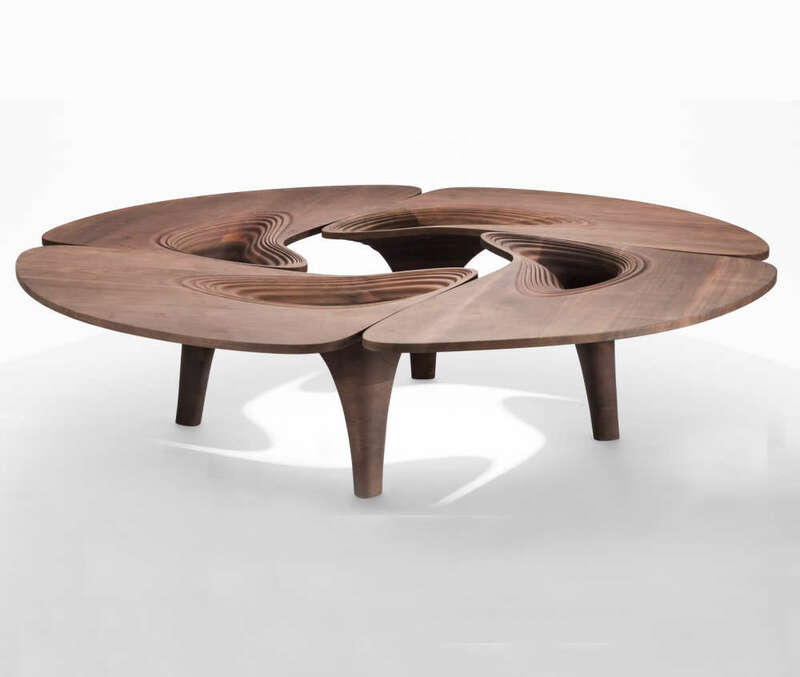 Each section of the table top appears to morph vortex-like into a hollow carved-out leg. Hard to guess, but this avant-garde console is the product of equal parts hi tech and hi touch! 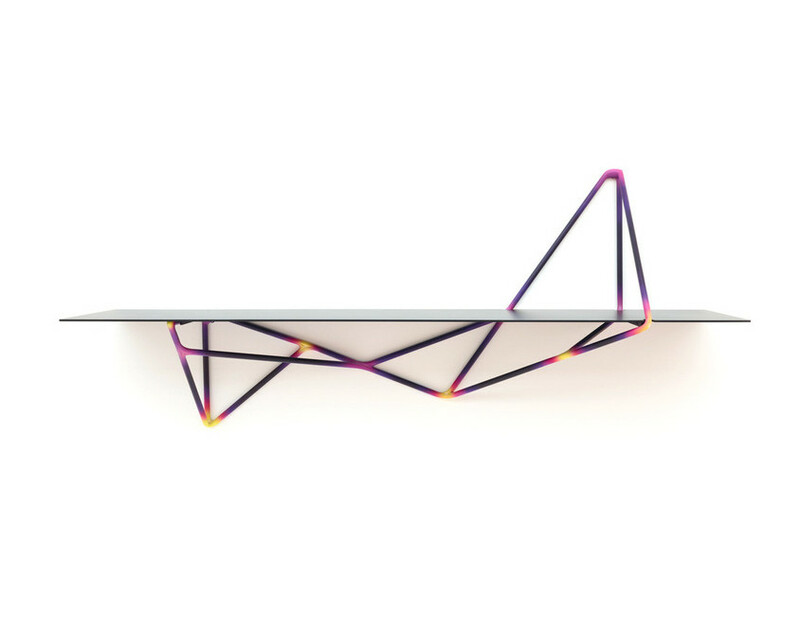 The Multithread shelf by Clemens Weisshaar and Reed Kram was created by 3-D metal printing but with a special twist. After software was used to analyze all the shelf supports, the aluminum tubings were assembled and painted by master craftsmen in colors that represented the amount of force applied to each joint. 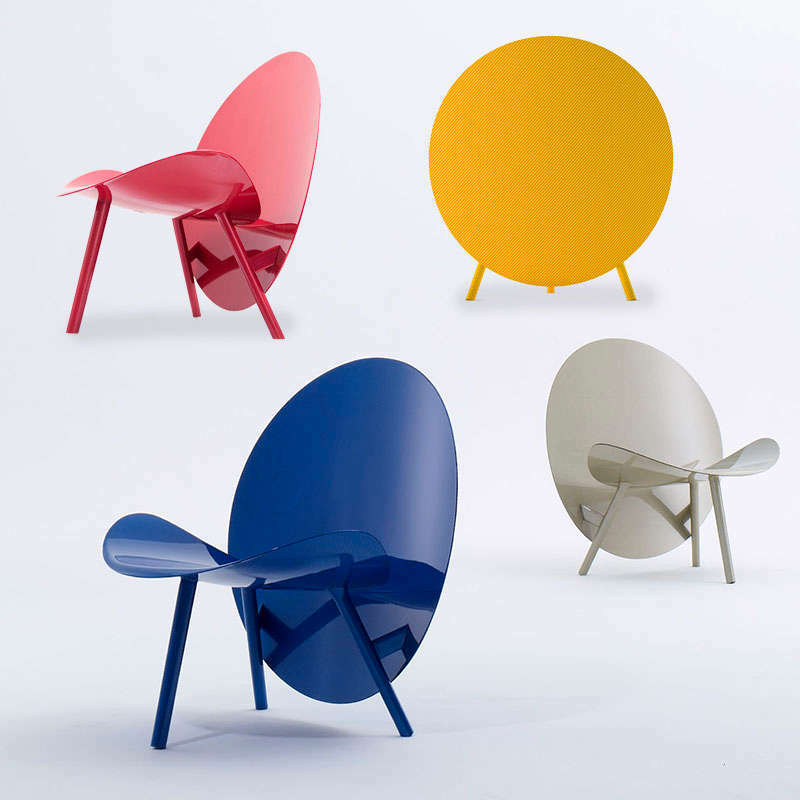 Cool and colorful lounge chairs that make a statement. These feather-light chairs by UK designer Michael Sodeau are made from Hypetex, a carbon fiber composite originally developed for Formula One racing. The large round seat back adds an air of intrigue to the space, providing privacy but retaining a playful look. Love the 3-dimensional look of the hammered stainless steel cabinet doors! The bespoke Corona Cabinet is made of South American rosewood, red leather, tempered glass, and a healthy dose of 1.5 mm stainless steel. 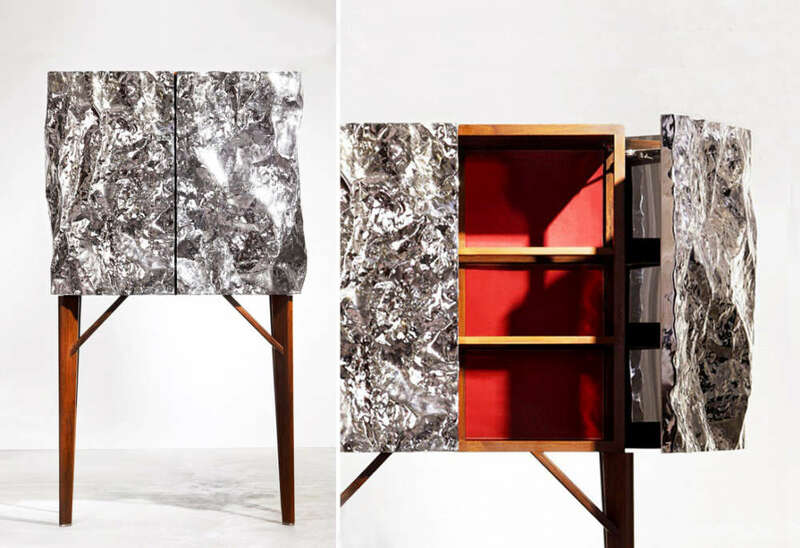 Originally inspired by corrugated metal sheets at a construction site, the design evolved into a stainless steel chassis hammered and polished to resemble granite veins. A pair of bi-fold doors provide convenient access to the storage. A veritable 2-trick rocking chair – you can use this rocker both horizontally and vertically! The Durotaxis Chair is made with advanced 3D printing technology capable of providing different material properties where needed: the structural parts are thicker and firmer, while the seats are thinner and softer. Essentially seating comfort is ingeniously programmed into the printing process, visually correlating the gradation of cell size and color to density and rigidity. A sculptural sideboard of patinated brass and walnut with pizzazz. 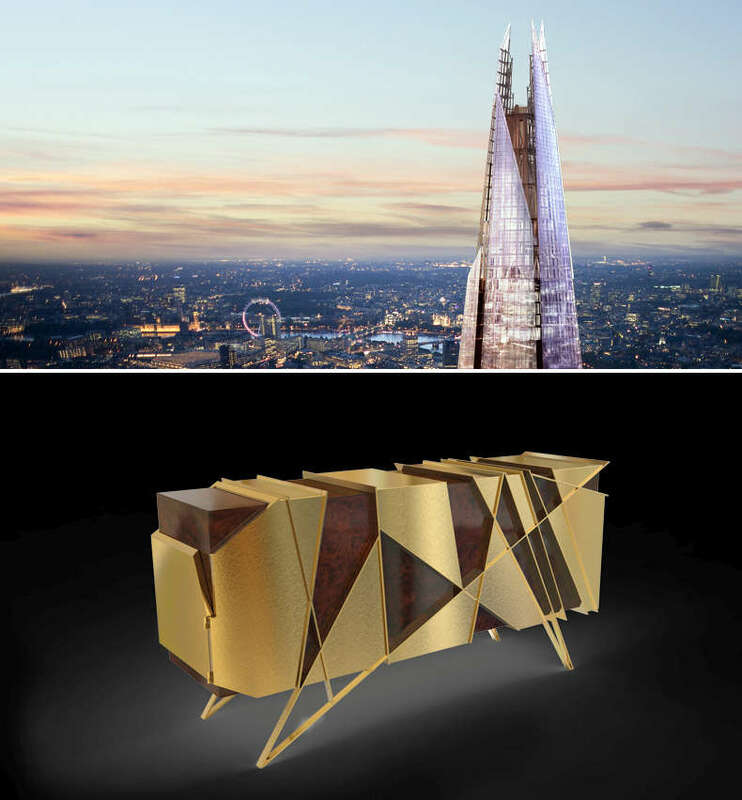 Portuguese furniture designer Marco Sousa’s Shards cabinet pays homage to renowned architect Renzo Piano’s grand London landmark, The Shard. The jagged, angular design was a re-interpretation of the London Church spires and tall ship masts that were the iconic building’s source of inspiration. Are the tables wood or metal? They’re both! 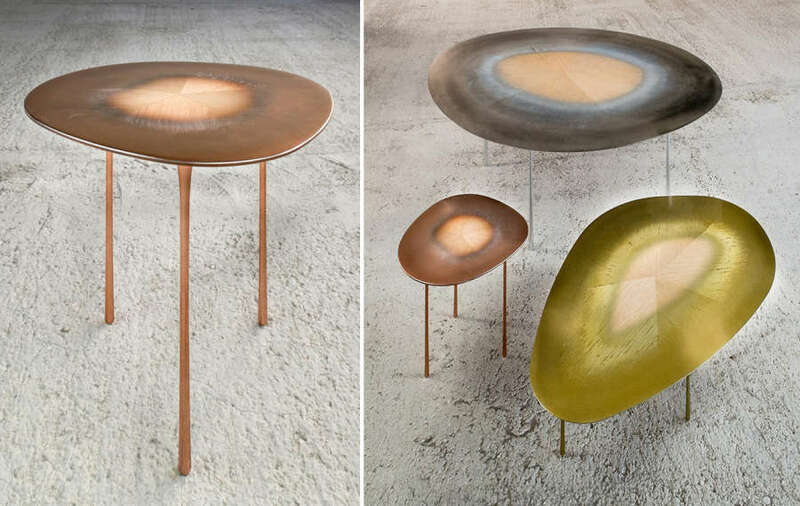 The Echo Table Series is a triumph in alchemy – by exposing wood sections to liquid metal, porous soft wood is replaced by aluminum, copper or brass. The resulting composite material has the look of natural heartwood ringed by a graduated metal-infused edge. The irregular tapered profiles and slender elongated teardrop legs certainly add to the tables’ organic vibe! This entry was posted in Furniture, Interior Design and tagged 3D Printing, Bookshelf, Cabinet, Coffee Table, Interior Design, LED, Seating, Sideboard, Wall Unit by Marie Chan. Bookmark the permalink.